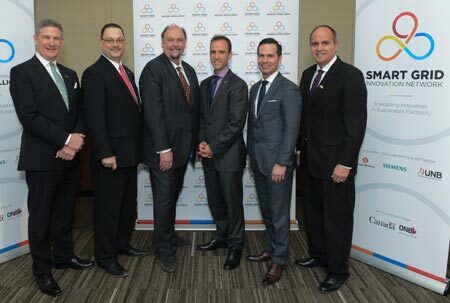 Siemens Canada, NB Power and the University of New Brunswick (UNB) are providing local and global companies with a new testing platform to drive innovation and support business ideas for development and export to world energy markets. The Smart Grid Innovation Network (SGIN) was officially launched today. SGIN will offer businesses a venue to design, develop and test smart grid related products and services, offering aspiring start-ups and established companies a testing environment to overcome technology hurdles. “This Smart Grid Innovation Network is Siemens’ newest investment in New Brunswick, and we are incredibly excited about SGIN as a catalyst for innovation and development in the business community with smart grid ready products and services as the outcome – not only to support smart grid deployment here in New Brunswick but to promote it throughout the Siemens world and beyond,” said Robert Hardt, president and CEO of Siemens Canada. Products and Services Lab at NB Power. Beyond the physical labs, SGIN is intended to offer a single point of contact for local and global companies for smart grid related development and testing, as well as provide research and development testing. To assist this, SGIN will host workshops and conferences to engage and exchange knowledge among users and potential users of the network. Siemens will invest more than $1 million in funds and in-kind support over the next five years into the SGIN and its testing environment, known as the Interoperability Lab. NB Power will invest about $2 million in funds and in-kind support in its Product and Services Lab; and UNB has committed more than $2 million in cash and in-kind support, including National Science Engineering Research Council project research funding, to the venture. At the government level, SGIN is receiving a non-repayable contribution of $2 million from the federal government through ACOA’s Business Development Program to UNB for the creation of a Living Lab that will support the smart-grid power management research and development activities. In addition, Opportunities NB is investing $840,000 on behalf of the provincial government.